Recently Karen from Back Road Journal passed along a challenge to me. Thanks Karen for thinking of me, I´m honoured! I was also a little stumped as I haven´t been blogging for all that long and I had to pick out posts to show you in certain categories. The rules are that I should have published a link related to the categories I´ll mention below, and that I should pass the challenge on to at least 5 other bloggers (well, that bit it easy, there are so many wonderful blogs I am following!). The most beautiful post. This was tough, I´m not an expert photographer, but I chose my Cherry and Watermelon Granizada, as the colours evoke summer in a glass for me. The most popular post. Well, I was surprised, as it was one of the most simple things that I make but it got a huge number of hits. It was my Salsa Verde Spanish Style. Hopefully people are shaking it over everything from Cape Town to Texas! The most controversial post. Nothing really sprang to mind, but looking back, I did get a few surprised “looks” at my Slow Cooked Pig´s Trotters! The most helpful post has to be my Sun Dried Tomatoes. Again, so simple, but people seemed to like the simplicity of making these tasty little treats of sun dried gorgeousness. The post that was surprisingly successful was The Vegetable Garden – 1 Month on. I love that people ask me for advice. I don´t have a huge amount of experience, but am happy to share any knowledge that I have. The post that did not get the attention that it deserved. I suppose a lot of the early ones when I had less people viewing, but I think it was my Pork Ribs in Barbecue Sauce. Nearly everyone likes a BBQ rib…right?! The post that I am most proud of. Really tough, as I post on a variety of subjects, but it probably has to be my very first post. Not so much for the superb writing (joke!) but it´s because it´s where my Spanish story really started. Plucking up the courage to come to Spain alone which then led me on an amazing journey to where I am now. And having the courage to start to write (and finish) my book. And even though I don´t yet have a publisher, I´m proud of the fact that I did it. Finally, these are the folk I´d like to pass the challenge on to. I admire all their blogs, I love the variety of subjects I can read about, and I hope you get a chance to pop over to their blogs to see what they are up to. I´m looking forward to reading their responses too. A final huge challenge for me was actually posting this – 3 goes before WordPress decided to let me do it….grrrrrr! I knew you were going to say pigs’ feet. I just knew it. Isn’t it funny how interested in gardens everyone is. Yours does make me jealous. I am floored though that salsa Americana didn’t generate traffic for you. At least it made Big Man happy! Great post. I just love your blog. Ah those little trotters caused a stir! I think that your Salsa Americana was just a whole lot better than the Spanish version 🙂 Thanks for the kind words…love yours too (but I think you both kno that already!). How awesome! I am so glad you took the brave step to become a Spanish Chica and a blogger. Your little interweb space is one of my favorite places. I’m so very glad to have “met” you! “Igualmente” which means “likewise” in Spanish! Well done on your challenge!! I can’t wait to check out those other blogs too. 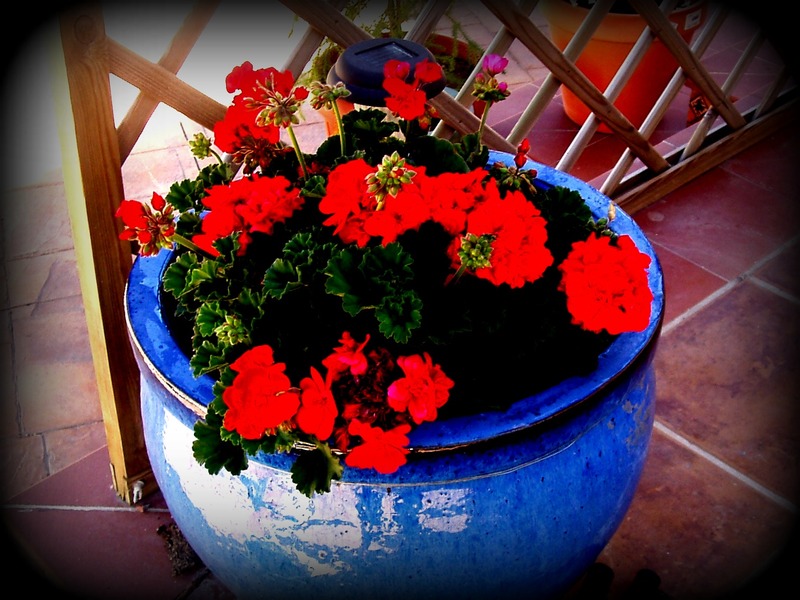 Lovely geranium photo – I love the vivid blue with the red. Your salsa verde Spanish style is Ace!! I am planning on a post, in which I will make reference to this recipe! What is great about your blog, is that your posts inspire us all. Bravissima!! Thank you and am feeling all flattered. Seems a lot of people liked the “sauce”. Your posts are equally inspiring…am saving up to visit all the lovely places you post about too! Tanya, what a great round up of your links – I am looking forward to reading your first post. Well done on your book! So exciting – why not publish it yourself? I have also been having huge problems with WordPress since yesterday – the post I was working on is completely gone into cyber space never to be seen again! When WordPress goes wrong it´s so frustrating! I have thought of self publishing – to be honest, it probably needs a good edit first and I know I am not going to be the next JK Rowling! Maybe one day…. I usually write my posts in Windows Livewriter and then publish them to WordPress. That way you always have a draft if the uploading goes wrong. Good idea – have started to do mine in word. Such a pain when you lose stuff after working hard on it for a while. A Challenging Challenge indeed!!!! Well, thank you for considering my posts to be of interest. Leave this one with me and l’ll see what l can come up with! Looking forward to seeing what you come up with! Well met, Friend! Can’t wait to go back and read through your links! Ah, it´ll be nothing for the girl who can do what you do with some of the things you have to “refashion”! I am so happy that you took the challenge and I agree with your choices. I had never gone back to your original post. I think that is what was nice about the challenge…it encourages others to look back and see the lovely posts they have missed. And I now have several new bloggers to follow. Thank you! Thank you – hope you enjoy some of my earlier posts (mainly stories at that point) and the other blogs. I agree, that was nice about the challenge! P.S. I have been having lots of trouble with WordPress for several weeks now. I can’t make comments on my computer or write posts from it…lost one completely. Using another computer is not very convenient. It´s been a pain – I suppose we should contact them and complain. I just keep saving and saving for fear of losing stuff. Thanks so much for tagging me in this! Now I better get my thinking cap on. I didn’t realise that you hadn’t been doing this very long, I’m looking forward to reading your book when it’s published too. And that banana bread sounds heavenly! Have you tried clearing your cookies & caches (have no idea what they are) but that’s the advice wordpress gave me when I was having problems, and things kept disappearing, and it worked. Can’t remember how I did it though!! You´re welcome, I love your blog, great recipes and the photos are always so stunning! Will see if I can work out what to do with my cookies (! ), it might just be a connection problem as we often lose the phone line/electricity here!! Thanks for the link and the challenge. I was reluctant initially, but when I found a few quiet moments (family asleep!) I enjoyed looking through some of my old posts. I like your funky geraniums! Am so glad you took up the challenge. I too was reluctant initially, but it was actually quite nice to go back and look at the older posts. I had a little play with the geranium photo – not something I usually do, but I was having fun! I have just found you and am so looking forward to finding our more about your life and your book. And you have such a yummy list of food up there I am off to have a better look! Well welcome! Do hope you enjoy what you see…have just popped over to yours…lovely! That is an amazing achievement 🙂 I hope you will find a publisher real soon.. Thank you so very much for all your lovely words. The book was such fun to write – something I had always wanted to do. Publishing it would be a lovely bonus! I’m glad you are enjoying the blog!